The BRIEF-A is a standardised measure that captures views of an adult's executive functions or self-regulation in his or her everyday environment. Two formats are used - a self-report and an informant report. Individuals aged 18 to 90 years. The Self-Report Form is designed to be completed by adults 18-90 years of age, including adults with a wide variety of developmental, systemic, neurological, and psychiatric disorders such as attention disorders, learning disabilities, autism spectrum disorders, traumatic brain injury, multiple sclerosis, depression, mild cognitive impairment, dementias and schizophrenia. The Informant Report Form is administered to an adult informant who is familiar with the rated individual's everyday functioning. It can be used alone when the rated individual is unable to complete the Self-Report Form or has limited awareness of his or her own difficulties, or with the Self-Report Form to gain multiple perspectives on the individual's functioning. When administered in conjunction with the Self-Report Form, the BRIEF-A Informant Report Form provides a more clinically comprehensive picture of the individual being rated. 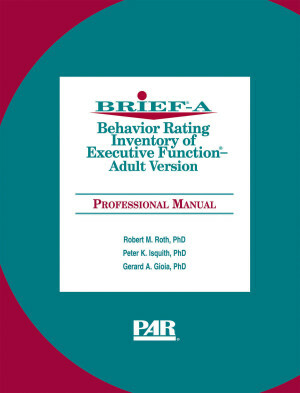 The BRIEF-A, based on the original Behavior Rating Inventory of Executive Function™ (BRIEF™), is composed of 75 items within nine nonoverlapping theoretically and empirically derived clinical scales that measure various aspects of executive functioning. The clinical scales form two broader indexes: Behavioral Regulation (BRI) and Metacognition (MI), and these indexes form the overall summary score, the Global Executive Composite (GEC). The BRIEF-A also includes three validity scales (Negativity, Inconsistency, and Infrequency). Norm sample includes US men and women from ages 18 to 90 years and from a wide range of ethnic and educational backgrounds, as well as geographic regions matched to 2002 US Census Data. 10 to 15 minutes to administer; 15 to 20 minutes to score.